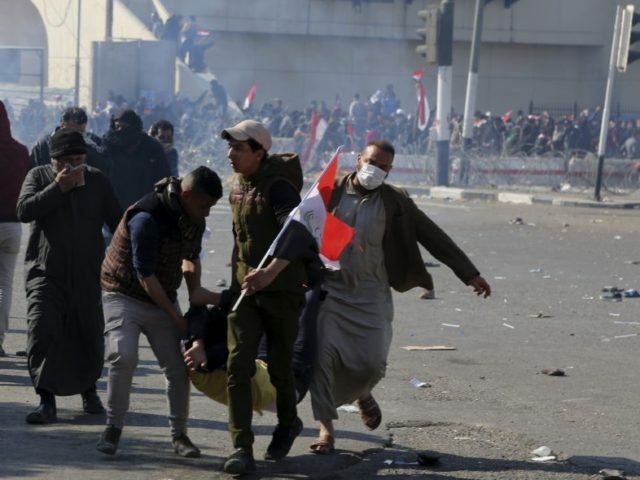 Violent protests, featuring a rocket launch targeting Baghdad’s government Green Zone, killed five protesters and a policeman in the Iraqi capital this weekend. The incident triggered yet another protest Tuesday as throngs of supporters of radical Shiite cleric Muqtada al-Sadr carried their colleagues’ coffins through the city streets. The Tuesday funeral procession for the five protesters killed on Saturday converged in Tahrir Square where the deadly protests began. The Saturday protests that killed the five and a policeman also injured nearly 200 others, though some estimates of the damage suggest over 300 may have been injured. A police source tells the Iraqi outlet Al-Sumaria News that police helped carry the coffins through the procession and over the heads of protesters in an attempt to keep the peace. The officer claimed that police actively facilitated the flow of protesters into Tahrir Square, possibly a move to prevent them from converging on the bridges that lead to Baghdad’s Green Zone, home to the capital’s government buildings and facilities. Anadolu Agency, the Turkish state news outlet, confirmed with authorities in Baghdad that officers had shut down all bridges into the Green Zone for the funeral procession. This did not stop the funeral-goers from using the procession as an excuse to stage another protest. Shiite Iran’s PressTV, citing Al-Sumaria, reports that those attending the procession were “demanding the resignation of a commission that oversees elections, ahead of a provincial poll due in September.” Anadolu confirms, noting that “anti-corruption slogans” were a prominent feature of the funeral. The protesters are followers of Muqtada al-Sadr, a prominent extremist Shiite cleric who has demanded that supporters of former Iraqi Prime Minister Nouri al-Maliki step aside in Baghdad, alleging corruption and elitism. Al-Sadr’s supporters have representation in the Iraqi legislator, where they often clash with al-Maliki supporters. One, Reuters notes, accused him and his followers of “sedition” at an especially troubled time for the country when the fight against the Sunni Islamic State should take precedence over political disagreements among Shiites. Meanwhile, another authoritative cleric, whom Al-Sumaria identifies as Mohammed al-Yacoubi, is warning Shiites to ignore “the work of the demons of mankind and the djinn” seeking to divide the Muslim community. This refers to the Islamic immaterial beings of lower rank than angels who Muslims believe are capable of both good and discord among humans on earth. Al-Sadr is also vocally anti-American and anti-Kurdish, demanding the United States cease supporting both Baghdad and the Kurdish Peshmerga in the fight against the Islamic State and threatening to organize violent action against America should this continue. While calling for stability, al-Sadr’s opposition to forces successfully fighting the Islamic State has repeatedly led to destabilizing activity in Iraq. The most dramatic example of such destabilizing activity occurred in spring 2016 when al-Sadr supporters successfully overran Iraq’s Green Zone. The protesters flooded the Iraqi Parliament, sitting in legislators’ seats and refusing to allow government officials into their work areas until al-Sadr himself demanded the protesters leave. The intent to repeat the incident appears present in Sunday’s protests, blocked by Iraqi law enforcement.